Are you our new Online Marketing Intern? Do you want to gain experience in marketing and social media in an arts organisation? 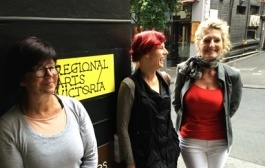 Regional Arts Victoria is looking for an Online Marketing Intern! This 3 month role is the perfect opportunity to work with our Marketing & Publicity Manager and gain experience in the production of online marketing materials. Applications close 12pm noon, Tuesday 14 April 2015. Click here for the internship details and how to apply. We’re looking for an Online Marketing Intern! This is a great opportunity to gain experience in writing for social media and website management.